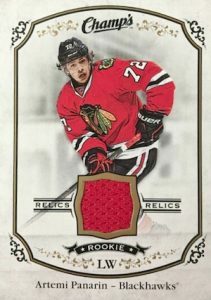 Returning to the UD lineup after a sizable absence, 2015-16 Upper Deck Champs Hockey showcases an eclectic view of the NHL. Collectors can find a variety of new inserts, parallels and relics in addition to one hard-signed card per hobby box. Base, Short Prints (1:2 packs) and High Series (1:5 packs) cards combine to form the 315-card base set in 2015-16 Upper Deck Champs. There are also three primary parallels with Gold Front, Gold Back and Silver (#/25) for each card in the base set. 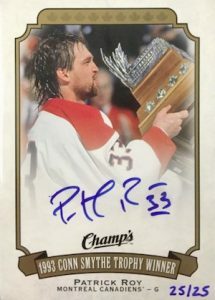 Featuring on-card autographs, the signed options include base Autographs (1:58 packs), Autograph SPs (1:87 packs) and Autograph High Series (1:285 packs) cards. More limited choices include Mini Autographs (1:288 packs), Conn Smythe Trophies Autographs (#/25) and the elusive #1 Pick Autograph (1/1). 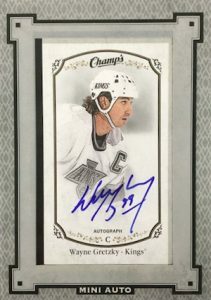 Offering even more hits, memorabilia pieces are featured heavily in 2015-16 Upper Deck Champs Hockey. 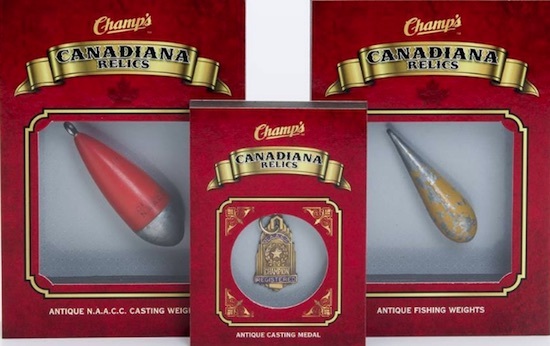 This includes Base Jersey (1:30 packs), Base Rookie Jersey (1:15 packs), Mini Jersey (1:400 packs), Framed Mini Tobacco Cards (1:1,200 packs), Canadiana Relics (1:600 packs) and Canadiana Odd Relics (1:2,800 packs). 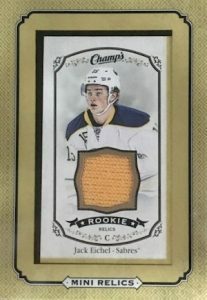 Several inserts close things out for 2015-16 Upper Deck Champs and average six per box. The themes include non-traditional options like Famous Food (1:52 packs), Fish (1:10 packs), Northern Wonders (1:35 packs), and Traditions (1:35 packs). 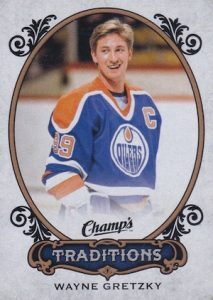 Hockey-specific inserts include tough pulls like #1 Pick and Conn Smythe Trophies. Each of these inserts averages 1:200 packs. Overall Odds: Short Print SP - 1:1.5 packs, High Series SP - 1:5 packs, Rare - 1:600 packs, Rare Stars - 1:1,200 packs. Gold Variant Back: Base - 1:20 / SP - 1:30 / High Series SP - 1:100; Silver #/25. 109 cards. Overall Odds: Base - 1:29 packs, SP - 1:87 packs, High Series SP - 1:288 packs. 10 cards. Overall odds 1:200 packs. 8 cards. Overall odds 1:600 packs. 26 cards. Overall Redemption odds - 1:2,800 packs. Specific redemption odds noted below. The odds below are for each redeemed redemption card. 8 cards. Overall odds 1:200 packs. 10 cards. Overall odds 1:50 packs. 30 cards. Overall odds 1:8 packs. 5 cards. Overall odds 1:1,800 packs. 15 cards. Overall odds 1:400 packs. 5 themes. Overall odds 1:1,200 packs. 30 cards. Overall odds 1:30 packs. 30 cards. Overall odds 1:15 packs. 15 cards. Overall odds 1:33. All Star � McDavid is part of Group A. All players in Group A combine to fall every 102 packs. Multiple that by the number of players in the group and you get the odds to pull a specific player (1:714 packs). So for years I have been hearing of UD’s demise which has prevented me from getting anything from them in fear of a unredeemable redemption card down the line. What is their current status and am I exaggerating their current financial situation? I like this set. 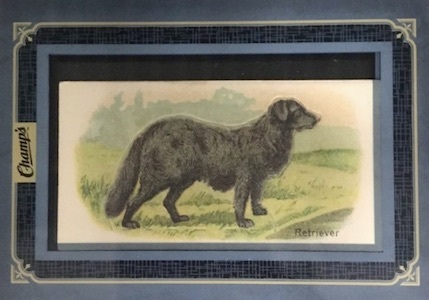 It seems like a cooler version of Allen & Ginter. 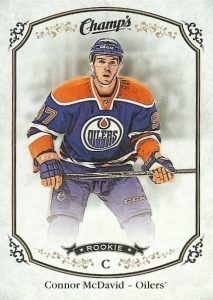 I just received the Canadiana Relic redemption from them today. The Fly Line Dressing Tin is huge! 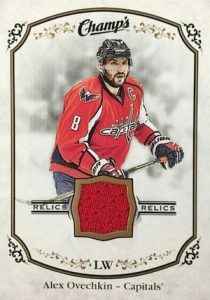 The redemption card made no mention that it was Odd relic. 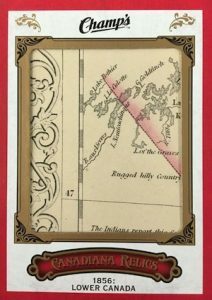 I thought I was going to receive a map card; it just said Canadiana Relic. I was pleasantly surprise. Between their hockey stuff & the Legendary game, I’ve been enjoying UD products for quite some time. 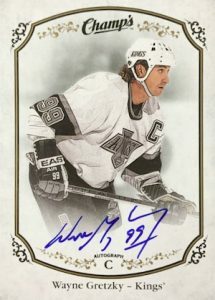 Fine and incredible hockey cards, very nice design! 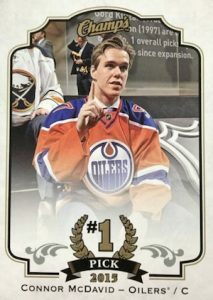 2015-16 Upper Deck Champs Hockey Hobby Box - McDavid RC?